To set out into the world, to be surrounded by the unknown and become a stranger. Only then would he be free to reinvent himself. Or fall in love. Dylan wanted one last adventure before the burden of adulthood was thrust upon him. And to confront the man he hadn’t spoken to since their intimate night together. Stealing a boat with his faithful companion Kio, their journey is cut short when they witness a brutal murder. A killer is loose in the Five Lands and attacking the most powerful families. Dylan—a potential target—seeks sanctuary from an unpredictable bodyguard named Tyjinn. Together they decide to turn the tables by hunting the killer down. Along the way, everything Dylan thought he knew about himself will be challenged, but if he survives, he stands to win the love he never dreamed possible. 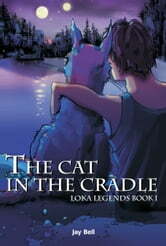 The Cat in the Cradle is the first book in the Loka Legends series and features twenty-five original illustrations created by Andreas Bell, the author’s husband. 5+ stars from BookWenches: "Mr. Bell's story combines youthful exuberance with mature humor, a fantastic adventure with political rhetoric, and an almost whimsical landscape with darkness and fear. I found this book to be fascinating and unusual and unexpectedly delightful, and I enjoyed every word of it." 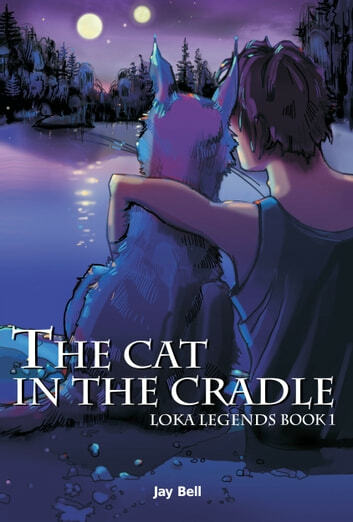 From 3 AM and Reviews by Jesse Wave: "The Cat in the Cradle is an utterly delightful, whimsical fantasy filled with a creative imaginative plot, great characters, solid writing, and eye catching art work." From Beyond Understanding says: "Many, many kudos to Jay Bell for writing such a riveting novel. I haven't read a book from cover to cover in one sitting for quite a while; The Cat in the Cradle, though, caused me to forget everything and just escape into a fantastical world full of magic and romance." Light hearted, fun story. Engaging characters and interesting alternate world.